Marcie Morton has been writing professionally since 1997, when she joined the technical writing team at Credence Corporation. Now a practicing chiropractor, she has also written several articles regarding injury prevention and wellness. Morton received a Doctor of Chiropractic degree from Palmer College of Chiropractic and a Bachelor of Science in biology from Chapman University. Tea tree oil (Melaleuca alternifolia) is a botanical extract valued for its antimicrobial properties. Topically, it can be effective in treating skin surface infections, such as acne, fungal nail infection (onychomycosis) and athlete's foot. During pregnancy, when medicines are avoided as much as possible, it is commonly assumed that botanical and herbal remedies are safe and natural alternatives. Safety of medicinal substances, whether plant-based or synthetic, should never be taken for granted. It is important to research any botanical before using it, especially during pregnancy. Tea tree oil, "when used topically and appropriately, is possibly safe during pregnancy and lactation." This means there is some clinical evidence that indicates it is safe to use in the proper dilution and when applied correctly to the skin. There are special considerations during labor, based on a laboratory study in which scientists observed a decrease in the force of spontaneous contractions in samples of rat uterus exposed to tea tree oil. These findings "suggest caution in the use of these essential oils during childbirth, as cessation of contractions could put the baby, and mother, at risk." It is unsafe for anyone to take tea tree oil by mouth. Like any undiluted essential oil, ingestion of tea tree oil can cause significant toxicity and lead to serious side effects. As mentioned above, tea tree and other essential oils can cause considerable toxicity if ingested. Effects range from confusion, inability to walk and disorientation, to full body skin inflammation (systemic contact dermatitis). Coma is rare, though possible, with at least one documented case following ingestion of 120 milliliters. Skin reactions to topical use can occur, and are probably related to the chemicals, eucalyptol and limonene, contained in the oil. Effects include irritation and inflammation at the site of application, as well as allergic contact eczema and dermatitis. Those using a tea tree oil product for acne may additionally experience local dryness, itching, stinging, burning or redness of the skin. The only time tea tree oil is applied to the skin at 100 percent concentration is in the treatment of nail fungus. When the oil drops are applied twice daily, these difficult to treat infections resolve over 3 to 6 months in about 60 percent of cases. For athlete's foot, topical application of 25 or 50 percent tea tree oil solution twice daily for one month is adequate, and is effective for roughly half of people who try it. Daily application of a 5 percent tea tree oil gel is all that is necessary for good results when treating acne. 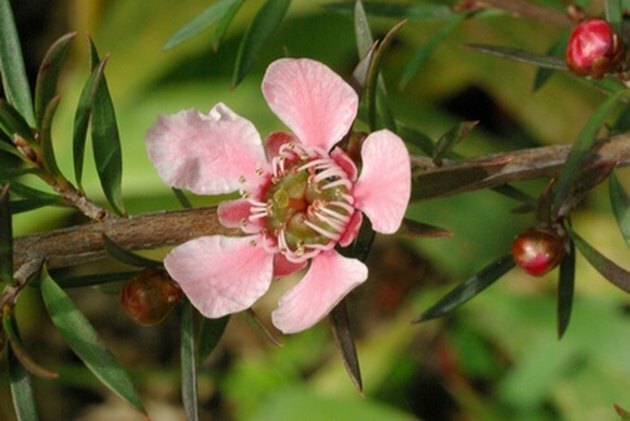 Tea tree oil is derived from the leaves of the plant by the same name. Volatile compounds contained within seem to kill bacteria and fungus while sparing normal skin flora, and also to reduce allergic skin reactions. In laboratory tests, tea tree oil has been found to inhibit growth of the yeast Candida albicans, and has shown in vitro activity against some drug-resistant strains of Enterococcus and Klebsiella pneumoniae. Additional evidence suggests that tea tree oil reduces allergic skin inflammation by suppressing the over-production of certain inflammatory mediators by the immune system.